MORE than 10,000 personal licences are expected to be revoked by boards across Scotland after licence holders failed to notify their board of completed refresher training in time. In what licensing lawyer and SLTN legal columnist Jack Cummins described as “carnage on a scale that I could never have imagined”, thousands of personal licence holders who obtained their licence on or before September 1, 2009, have failed to take the necessary steps to retain their licence ahead of the November 30 deadline. Those who have not complied will have their licence revoked and cannot apply for a new one for five years; if the licence was held by the designated premises manager (DPM), another PLH must be named as the premises manager within six weeks or alcohol cannot be sold on the premises. 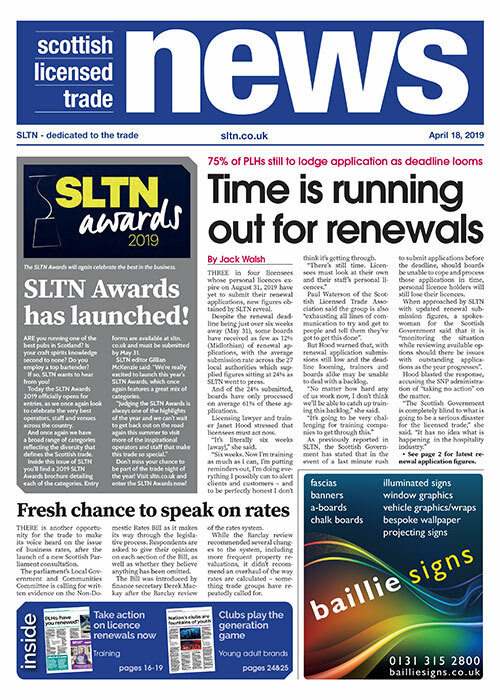 As SLTN went to press, figures collated by licensing law journal SLLP from 20 of Scotland’s licensing boards showed more than 8300 personal licences were set to be revoked. Cummins predicted the final number could be over 10,000. Glasgow licensing board told SLTN that around 1300 personal licences would be revoked, 130 of which were held by designated premises managers. “Unless the affected 130 premises install a replacement manager within six weeks they will not be able to sell alcohol, although we are working to avoid this eventuality,” said a spokesman for the board. In South Ayrshire, the licensing board said it expected to revoke 334 personal licences, one of which was held by a premises manager; in Dumfries & Galloway, 286 PLHs had failed to comply, five of which were designated premises managers. The number of personal licences to be revoked in Edinburgh was understood to be around 1000, Fife was 766, Highland was 639, Perth & Kinross was 479, and in Argyll & Bute 425 personal licence holders had failed to notify the board of completed refresher training by the deadline. Cummins said the numbers are worse than expected. “Worries about refresher training have been constantly flagged up by SLTN for over a year – but this is carnage on a scale that I could never have imagined,” he said. “And the cull of personal licence holders won’t stop here: there are likely to be thousands requiring to notify boards over the coming months.